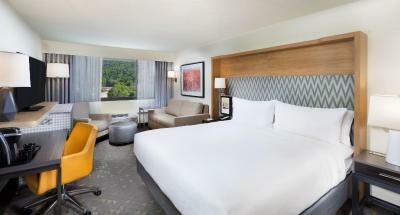 Lock in a great price for Holiday Inn Asheville - Biltmore East – rated 9.2 by recent guests! The hotel is new and sparkling clean, great location with easy parking. Staff was friendly and helpful. We did not have breakfast at the hotel, but the restaurant attached is outstanding for dinner! Clean, comfortable.....pillows melted around your head! Would've liked to had continental breakfast....another 10 dollars! Outside is a little dated but the inside is extremely nice and clean. The staff was great, especially the bar tender. The bar was phenomenal. Very relaxed and calm. Rooms were spacious and nice. Will return. everything. from staff to facilities to the room. very impressed. will definitely stay here again. and that should be soon. Beautiful lobby, rustic, mountain decor with stone fireplace. Beds were very comfortable with large pillows. Bathrooms appeared to be recently updated. Outstanding service from the staff. Thomas at the front desk was very friendly and gave us several local recommendations to try. Room was gorgeous and loved the extra storage that you don’t normally get in a hotel room! Staff was very nice and accommodating. Room was functional with great mirror use for multiple females getting ready at once. Coffee in lobby was excellent. 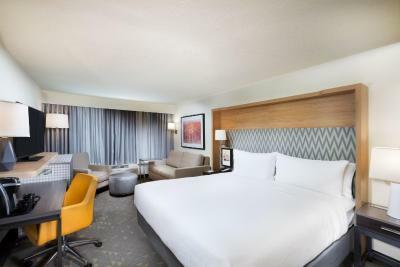 Holiday Inn Asheville - Biltmore East This rating is a reflection of how the property compares to the industry standard when it comes to price, facilities and services available. It's based on a self-evaluation by the property. Use this rating to help choose your stay! This pet-friendly Asheville mountain lodge-style hotel features a heated outdoor pool, on-site dining, and free WiFi. Biltmore Estate, Winery and Gardens is 6.2 mi away. A cable TV, coffee machine, and a seating area are offered in each room. Holiday Inn Asheville - Biltmore East extras include wood furniture, and some rooms have a microwave and a refrigerator. The Woodfire Grille & Bar features local produce, home-style American dishes, and local micro-brew beers by the pint. Beer flights and moonshine cocktails are also offered. A 24-hour fitness center, gazebo, and Dog Wood Walking Trail are on site. A business center is available to all guests throughout their stay as well. The hotel is 1 mi from an entrance to the Blue Ridge Parkway scenic highway and 4.3 mi from Asheville Mall. Chimney Rock Park, which offers 1000-acres of hiking trails, is 40 minutes' drive away. This property is also rated for the best value in Asheville! Guests are getting more for their money when compared to other properties in this city. 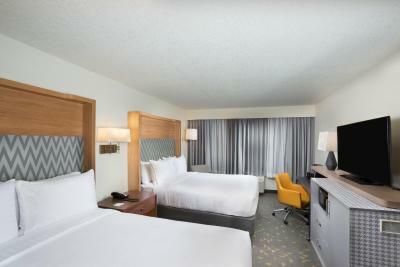 When would you like to stay at Holiday Inn Asheville - Biltmore East? This room features 50-inch flat-screen TV, Keurig coffee maker and a work desk. 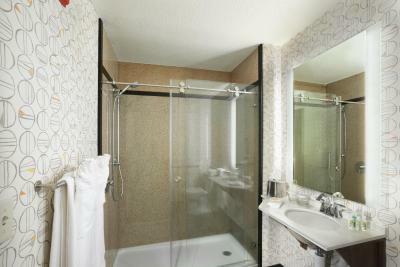 Spacious room includes a sofa bed and a large bathroom with spa amenities. This accessible room has cable TV and a work desk. The Holiday Inn Biltmore East has completed the renovation of all the common areas of the Hotel from lobby to the walking trail. 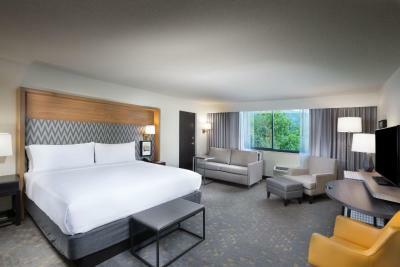 We have 111 spacious rooms from rooms with single King Beds to Rooms with two Queen beds. 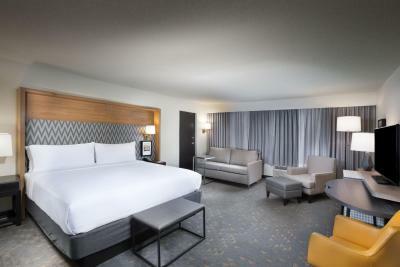 House Rules Holiday Inn Asheville - Biltmore East takes special requests – add in the next step! Holiday Inn Asheville - Biltmore East accepts these cards and reserves the right to temporarily hold an amount prior to arrival. Only very minor issue was the bed is firmer than I am used to. Awesome facilities! More than I'd like to spend but, comparing other motels not out of the curve! No free breakfasts here, or second breakfastses! Photos were a bit misleading about the location of the property. There’s a gas station right in front of the hotel and houses, along with other hotels, surrounding the property. No big deal though. Check in. The gentleman was trying to do too much at one time. Only two persons to take care of hole breakfast wasn't enough. Bed too soft, location is far from downtown. Though bathrooms were recently remodeled, they did not have a bathtub. That we had to pay for the same breakfast we get free at all other Holiday Inns. We didn’t eat. Perfect location to Warren Wilson College area. It was charged USD35/day extra for the pet, what I considered extremely exaggerated. Not to mention that they asked to never leave her alone in the room. How can I travel to some place and have my pet with me all the time I am off the hotel? What restaurants would accept us... They have to decide if they are really pet friendly or not. Not to mention that this is not mentioned in their reservation instructions.